Four gorgeous stranded designs, perfect for gifts! Ringtail hat features an adorable Ringtail (or Miner's) cat motif. The coordinating Ringtail mitts, with their simple geometric pattern, beg to be knit in a soft decadent yarn. 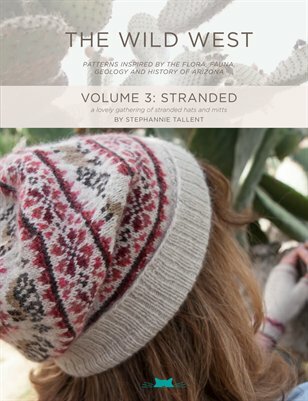 The Organ Pipe beanie and Organ Pipe mitts feature a pretty cactus flower motif. The mitts also have an amazing textured bicolored rib for the main body.